Zesty lemon dessert served with a crisp vanilla shortbread biscuit and raspberries macerated with fresh mint. Place all of the ingredients in a mixing bowl and mix with your fingertips until you have a dough. Kneading by hand until you have a firm ball of dough, roll into a cylinder using cling film. Refrigerate for 30 minutes before cutting into slices 5mm thick. Pick the leaves from the mint and shred finely. Add the mint to the raspberries and mix together in a bowl with the caster sugar and a drizzle of white wine. 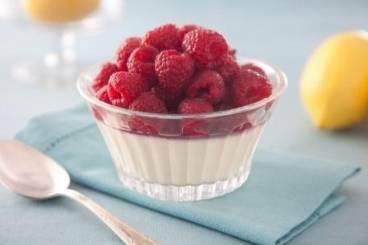 Serve the possets in the glass, topped with the raspberries and serve the shortbread biscuit on the side.